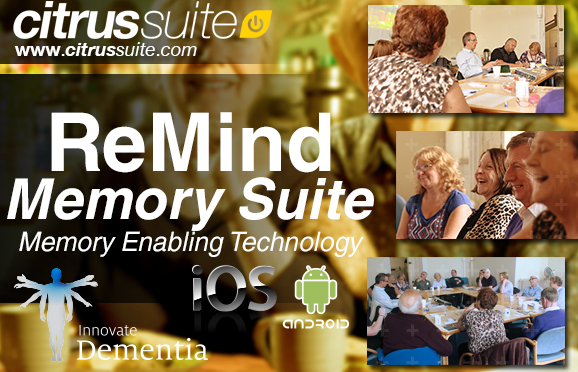 ReMind Memory Suite: Memory Enabling Technology (AKA ReMindMe) for iOS / Android, apps designed to help people to live well with dementia and support carers. The app includes alerts, reminders and image slideshows with plans to integrate social features and more during phase 2 of development. The project team (Citrus Suite app developers, Innovate Dementia, Liverpool John Moore University, Mersey Care, clinicians, service users, carers, researchers, etc.) identified the need to develop memory enabling technology which positively integrates into the lives of those living with dementia, is empowering and is specifically designed for a person with dementia (1st person), and has great benefits to carers. The foundation is co-creation, leading technical ability and design skills aligned to create a product that will exist in response to need and will be widely accessible on completion – leading to use in many clinical & social areas. Read about the co-creation sessions here. ReMind Core App: iOS / Android tablet & phone apps for use by the person living with dementia and carers. Working as a standalone product or will link into the Care app (below). Smartphone version will be available if the end user prefers a small screen device (useful if they would like interventions when away from the home). ReMind Care: iOS / Android. A version designed specifically for carers. Alerts / reminders can be added remotely, two-way interactions are possible. Carers can track whether the user is interacting with their own version of the app. Primary user: person living with early onset dementia. Independent users or assisted user. Secondary user: relative (/ friend / carer) of person living with early dementia. 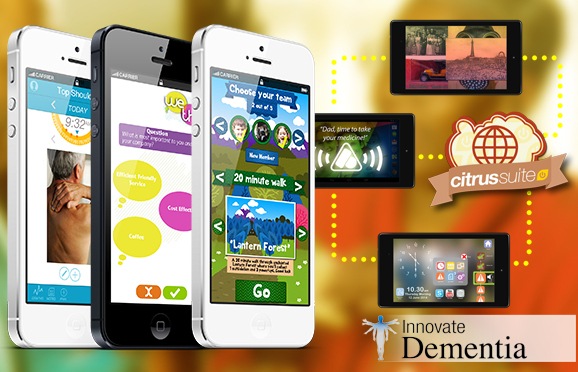 Can use the app to support their own care tasks or set up device for person living with dementia. Professional user: person in the professional care services, health service, mental health services or housing provider. Messages sent to independent users or assisted users living in their own home. Secondary user: to support caring – setting alerts for person with dementia, checking that they are aware of upcoming appointments, household tasks, etc. Professional user: tracking user engagement, providing information about support services, alerts about events / services. Users based in their own home. Fee Fi Fo Fit is a wellbeing app / game that will help young families get active. From 138 ideas, entered from across Europe, Citrus won Health X award from Public Health England with an app that engages and gets young families active. Fee Fi Fo Fit will be part of the Change for Life campaign, it’s coming together really well, could this be Citrus’s 4th number one hit app? Citrus Suite – Future Leader Award 2015 – Citrus Suite has been selected as one of the 10 Future Leaders; a list that Creative England believe showcases some of the best creative talent in England’s regions.